Amber Lavender Aphrodisia Massage Cream combines french lavender and damiana tea which are carefully blended with Vitamin E and aloe vera. The non-greasy formulation leaves skin hydrated and soft. 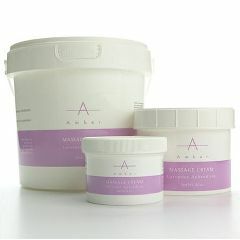 Amber's massage cream offers a base rich and heavy in texture creating an effortless glide for versatile massage techniques. The lavender aphrodisia massage cream is a rich cream that when emulsified and manipulated turns from a cream formulation into a strong, easy-to-use massage oil providing an easy grip for deep tissue massage. Available in 8 oz, 32 oz and 1 gal container.